Are you a group of 20 or more people? You are entitled to special prices! By filling in the form below, you can request a special deal which will be sent directly to you at your specified address. Groups of minimum 20 paying adults of the same pass category (reduced age tariffs excluded). One ticket free every 25 adults paying. Skipass valid on Courmayeur ski resort. 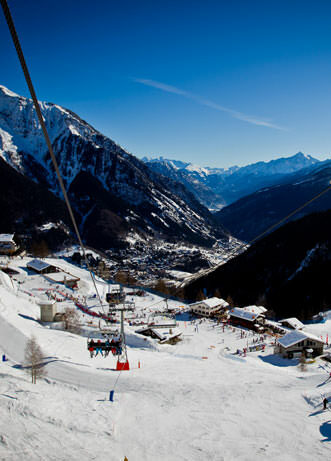 Skipass valid on Courmayeur + Skyway Mont Blanc ski resort. Valid in Courmayeur ( and 1 2 3 days in Skyway Mont Blanc or another Aosta Valley ski resorts ). * FREE PASS: Children under 8. Born after October 31st 2010. This free pass only will be issued if one adult, youth or senior purchases a consecutive day pass equal or superior in days. If there is no purchase by an adult, the fare will be the one for <8 CHILD WITHOUT ADULT. ** YOUNG: 8 to 14 years old. Born after October 31st, 2004. ** YOUTH: 14 to 18 years old. Born after October 31st 2000. ** SENIOR: Born before May the 31st 1954. Proof of age is required (Id or birth certificate). This document is not a contract. The management of the CMBF reserves the right to modify without prior notice and any part of this list. Available at the ticket office: adult fare € 3.00 - children < 8 € 1.50. Price unique € 2.00 if the insurance is purchased by all the persons of the group. Confirmation of at least 2 days before arrival with the telephone credit card system or by bank transfer where the funds are received at least 7 days before arrival. Possibility to pick up the skipass at the Hotel. Valid in Courmayeur + Skyway Mont Blanc. Facilities on the shuttles Courmayeur-Chamonix. Info at Savda +39.0165.367039. Special discount on the pass for the Mont Blanc tunnel. Contact our cash desk for details or call +0165.846658. Confirmation of at least 2 days before arrival with the telephone credit card system or by bank transfer where the funds are received at least 7 days befor arrival. Available at the ticket office : adult fare € 3.00 - children < 8 € 1.50. Insert number of insurances needed. If the whole group buys the insurance, the cost will be 2.00 € each. Ai sensi del Regolamento UE 679/2016 in materia di protezione dei dati personali, si informa che i dati conferiti compilando gli appositi riquadri nonché l’invio facoltativo, esplicito e volontario di posta elettronica agli indirizzi indicati su questo sito comporta la successiva acquisizione dell’indirizzo del mittente, necessario per rispondere alle richieste, nonché degli eventuali altri dati personali inseriti. Tali dati saranno trattati esclusivamente per finalità amministrative, per rispondere alle richieste esplicitate, ivi compreso l’invio di materiale informativo. Il conferimento dei dati, pertanto, pur essendo facoltativo è assolutamente indispensabile per fornire le risposte attese. Tali dati non sono oggetto di comunicazione e sono trattati con strumenti manuali, telematici ed informatici dal personale nominato incaricato del trattamento. Sono salvi i diritti dell’interessato previsti dall’art. 15 del Regolamento UE 679/2016, che potranno esercitarsi in qualsiasi momento rivolgendosi alla COURMAYEUR MONT BLANC FUNIVIE SpA, Strada Dolonne – La Villette, 1b, 11013 Courmayeur (AO). The first aid service on the pist has a cost, any intervention will have a charge of 200 € to cover part of the cost of the rescue. Check if your insurance covers this, or buy cover at the same time as your lift pass at the cash desks or online: www.24hassistence.com.